With curves, colours and organic metabolistic architecture, these buildings are definitely out of the ordinary and worth a visit. Sometimes architects are also artists, as can be seen by the selection of weird and unusual architecture below. Here we travel to Sopot, Poland to visit The Drunk House, we see some of the incredible work of Friedrich Regentag Dunkelbunt Hundertwasser in Vienna Austria and enjoy a stay at a hotel in the Basque Country of Spain. We also visit two examples of so-called organic Metabolist Architecture. Also known as the Unvertical, the building was designed by Szotyńscy & Zaleski, this boldly created building is on the Baltic coast of Poland. The design was inspired by the fairytale drawings of Per Dahlberg and Jan Marcin Szancer. While it makes you feel a little dizzy looking at the outside, the interior is perfectly normal and houses shops and restaurants. This building is one of several, designed by Friedrich Regentag Dunkelbunt Hundertwasser and located in Vienna. 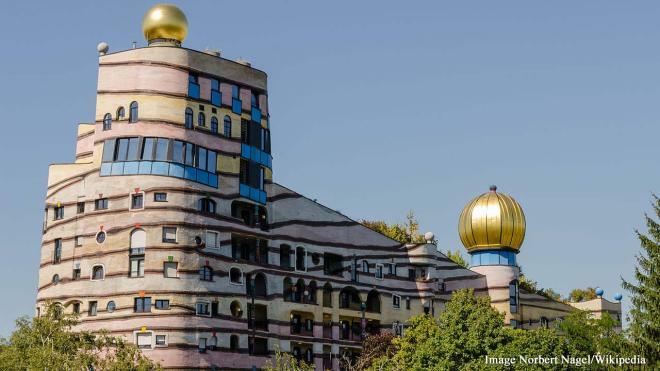 Hundertwasser prefers curves and spirals to straight lines and his eccentric buildings have mismatched windows, undulating floors, unexpected domes and trees growing from them. Three of the most famous structures are the Hundertwasserhaus apartment building, the KunstHaus and the local heating plant, Fernwarmewerk.